The Martin Luther King, Jr. National Historic Site in Atlanta, Georgia (established in 1980) includes King’s boyhood home and the Ebenezer Baptist Church (he and his father had been pastors there), the Civil Rights Walk, a Gandhi statue, the World Peace Rose Garden, the King Center, a colorful mural about King’ life, The Freedom Walk, The Chapel of All Faiths, a modern church, an internal flame and, last but not least, a reflecting pool and the tombs of Rev. Martin Luther King, Jr. and his wife Coretta Scott King. My original intent was to make a 1-minute video about my entire trip to Atlanta, where I had gone this week for a screening of my documentary All God’s Children at PushPush Theater and to visit my friends Debbie and Rob and maybe catch a glimpse of Mike and Pat. However, when Debbie and I went on our photo and video safari through Atlanta, I was so moved by the memorial to Rev. King and his message, that I decided to just focus this short minute on the MLK National Historic Site. As mentioned above there are quite a few elements to the historic site, but I was most taken in by the restored church, with his original microphone and his voice booming over the speakers. What a man, what a beautiful message of equality and peace! So fitting again in our time right now with all the protests here in America and overseas. The snippets you hear seem to be excerpts from a variation of the “I have a dream” speech. 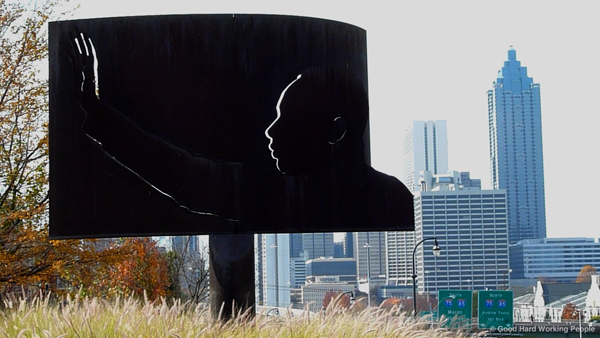 Now my plan is to upload a few photos of the Atlanta visuals that didn’t make it into the video (street art, Oakland cemetery, etc.) to my Flicker page instead. I’m especially happy to finally have my dear friend Debbie Foreman in a video. She has been by far my biggest supporter in this “In A Minute” endeavor – not counting Scott, who’s great at giving me constructive feedback while I’m editing. If you want to see more, please check out my photo blog post: Photos from the Martin Luther King Jr. National Historic Site (Atlanta).